Click to watch video clip for an introduction to budgeting. Click on each accordion tab or the next and back buttons to advance through the resource. Regan is a college sophomore living with her aunt to save money on living expenses while she attends school full time and works part time. She needs to create a budget to keep track of how she spends her money each month. Some people prefer weekly budgets; others prefer semi-monthly budgets, so two per month. Regan prefers a monthly budget to get a good view of all of her income and spending. You'll help Regan create a budget by figuring out where her money comes from and goes to each month and putting that information into a budget worksheet. Download a budgeting spreadsheet by choosing either the Excel or the Google Drive link at the bottom of the page. For Google Drive, you will be prompted to sign in to your account and then make a copy. NOTE: If you are using a mobile device, to be able to edit, be sure you have the Google Drive and Google Sheets apps downloaded. For Excel, choose the "Save" option so that you can save your work. NOTE: You must save the Excel spreadsheet before closing it or your work will be lost and you will have to start over. On the spreadsheet, insert Regan's monthly expenses. Use the spreadsheet to answer the questions in Test Your Knowledge #1. Regan works part time at the city hospital and earns around $800 per month. Scholarships cover most of her nursing school tuition, but she has one small loan to cover what scholarships don't. Fortunately, she doesn't have to start paying back the loan until after graduation. Currently, her only out-of-pocket school expenses for each of the two semesters are about $700 for books, which she buys used whenever possible. Regan lives with her aunt, which minimizes her expenses, but she still has to pay for some things. Because she knew she'd be living 10 miles from campus, she saved money from her summer job, birthdays and holidays and bought a car before she left for school. She doesn't have to pay for public transportation or make a car payment, but she does have to pay $115 a month for car insurance and another $35 twice a month for gas. Regan doesn't pay rent but does buy some groceries to share and all of her own personal care items, such as shampoo, toothpaste, and eye drops, which come to about $140 each month. For now, Regan is using her family's old computer, but it's pretty outdated and needs to be replaced. She's trying to save $750 to purchase a new computer next year. Because her job and school keep her so busy, Regan looks forward to the occasional night out with friends for dinner and a movie. She tries to limit these outings to once a week and her spending to around $20 each time. She loves clothes but tries to limit herself to one big shopping trip each of the four seasons with a shopping limit of $200 each time. Regan, like almost everyone she knows, is pretty much glued to her phone when she's not working or at school, so she sees her $75/month unlimited text and data plan as non-negotiable. Finally, Regan knows that after college she really wants to move to a big city near an ocean, maybe San Francisco or Boston, and that moving and an apartment deposit are expensive. To make her dream come true, she saves a little each month from her job and much of the extra money from working full-time and overtime during the summer. She knows saving is important and put this money directly into a special savings account. Use the completed "Student Budget" spreadsheet to answer the questions below. 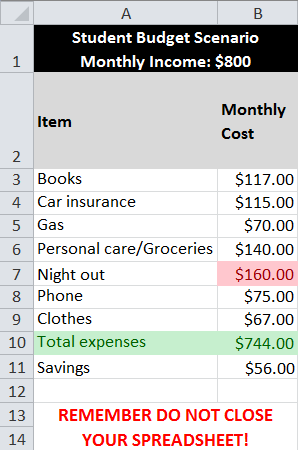 Based on the budget information you entered into the spreadsheet, how much money does Regan have leftover to split between saving for a new computer and saving to move after college? That is correct. Great job! Taking Regan's income of $800.00 per month and subtracting her expenses leaves her with $136.00 to split between saving for a new computer and saving to move after college. That is incorrect. 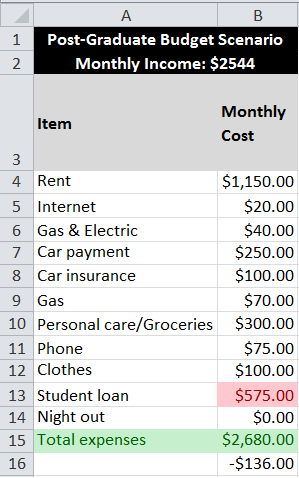 Taking Regan's income of $800.00 per month and subtracting her expenses leaves her with $136.00 to split between saving for a new computer and moving after college. What amount would Regan have left to save if she were to go out twice a week instead of once? Update your spreadsheet to find the correct answer. That is correct. Awesome. 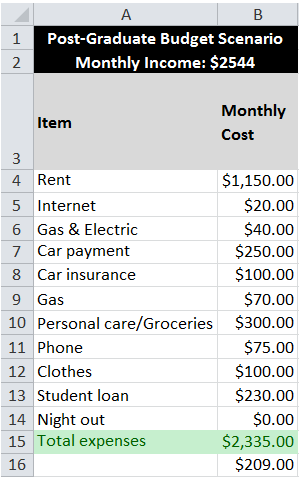 Taking Regan's income of $800.00 per month and subtracting all of her expenses, including a doubled entertainment budget, would leave her with only $56.00 to split between saving for a new computer and moving after college. That is incorrect. 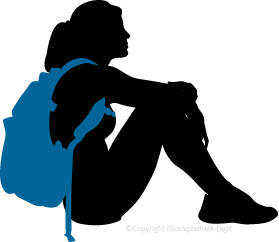 Taking Regan's income of $800.00 per month and subtracting all of her expenses, including a doubled entertainment budget, would leave her with only $56.00 to split between saving for a new computer and moving after college. Read "More About Regan" below. Go to the spreadsheet and select the "Post-College Budget" tab at the bottom. Insert Regan's expenses. Use the spreadsheet to answer the questions in "Test Your Knowledge #2." Regan has graduated from nursing school and found a terrific job in one of her dream cities—at an award-winning hospital with lots of room to grow. With a new income, it's time for her to rework her budget. Saving during college for a move later was a huge help. From the small amount she saved each month plus extra money earned working full time and overtime in the summers, Regan graduated from college with about $6,000.00 in savings. This money paid for her moving expenses, the deposit and first- and last-month's rent on her apartment, and a down payment on a new car. After these expenses she still had about $1,000.00 for emergencies. Regan loves living close to work and within view of the ocean, but apartments in her new city aren't cheap. Even though rent would be cheaper in a smaller city, an expensive, small apartment near the ocean is worth it to her. She and her roommate split the $2,300 monthly rent on a very small two-bedroom apartment in a charming old building. The rent includes a couple utilities (trash and water service), but otherwise Regan and her roommate split all of the bills evenly. Internet service costs her $20 a month and gas and electric are another $40. Regan's monthly car payment is $250 and, thanks to being a little older and a college graduate, her insurance is slightly lower now—$600 every six months. She still spends about $70 on gas and about $75 on her mobile phone every month. Regan needs only simple scrubs for work clothes, but she still loves to dress up on occasion. She looks forward to shopping sprees with girlfriends and limits her budget to about $300 each season. Her expenses for groceries and personal-care items are much higher now—around $300 per month. Although Regan loves going out with friends, her shift schedule makes that very difficult, so she isn’t allocating any money toward that expense right now. Regan has really good savings habits, though, and takes advantage of the 401(k) option her employer offers. Luckily, the 10 percent of her gross pay she saves for retirement in a 401(k) plan is taken right out of her check. She never sees the money, so she doesn't even miss it. She knows it's smart to have three to six months' worth of living expenses saved for emergencies. So, to rebuild her savings, Regan deposits $200 from each paycheck directly into a savings account. Regan was smart about student loans and took out only the loans she absolutely needed, which totaled $20,000. She's on a 10-year repayment plan with payments of about $230 each month. Regan's take-home pay (after taxes, her health insurance payment, and deposits into her 401(k) and savings accounts) is $2,544 a month. Use the completed "Post-College Budget" spreadsheet to answer the questions below. Based on the budget information you entered into the spreadsheet, how much money is left over each month for Regan to use for all other spending? That is incorrect. Taking Regan's income of $2,544.00 per month and subtracting her expenses leaves her with $209.00 for all other spending. That is correct. Bravo! Taking Regan's income of $2,544.00 per month and subtracting her expenses leaves her with $209.00 for all other spending. What if, instead of taking out $20,000 in student loans, Regan had taken out $50,000 so she didn't have to work during the school year? With a $575 loan payment per month, how much money would she have left for all other spending? That is incorrect. With this scenario, Regan would have no money left over, and she wouldn't even make enough to cover her current expenses. She would have to cut expenses elsewhere, such as foregoing a new car, finding a less-expensive phone plan, spending less on clothes, or living in a less-expensive city or apartment. To find the correct answer, you increase the amount of money she spends on her student loan to $575.00. That is correct. With this scenario, Regan would have no money left over and wouldn't even make enough to cover her current expenses. She would have to cut expenses elsewhere, such as by foregoing a new car, finding a less-expensive phone plan, spending less on clothes, or living in a less-expensive city or apartment. What if Regan bought a much more expensive car with a $425 payment per month? How much "play" money would she then have left? That is incorrect. The increased car payment would leave Regan with only $34 each month. That's less than $10 per week! She would have to cut expenses elsewhere, such as by finding a less-expensive phone plan or spending less on clothes. That is correct. The increased car payment would leave Regan with only $34 each month. That's less than $10 per week! She would have to cut expenses elsewhere, such as by finding a less-expensive phone plan or spending less on clothes. Regan's careful planning and diligent saving helped her reach her goal of living in a big city by the ocean. By taking out only the student loans she absolutely needed, driving an older car during college, and keeping her spending on shopping and going out at a reasonable level, she graduated from college with money in the bank. Now it's your turn. 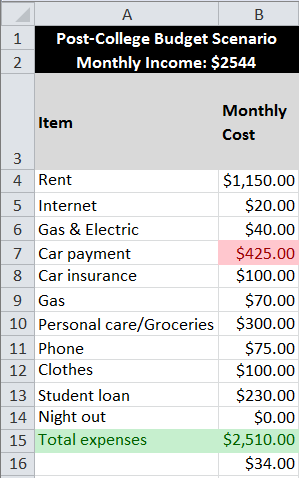 Use the third tab in the spreadsheet (or open a new document by clicking on one of the links below) to create your own budget. Refer to Regan's budget tabs if you need ideas for spending categories to include in your own budget. Borrowing - Taking money with a promise to repay the money in the future. Budget - An itemized summary of probable income and expenses for a given period. A budget is a plan for managing income, spending, and saving during a given period of time. Discretionary income - The portion of personal income available for spending after taxes and basic essentials have been deducted. Disposable income - The amount of a person's paycheck that is available to spend or save. Expenditures - Money spent to buy goods and services. Expenses - The costs people incur for goods and services. Expenses are often categorized as fixed, variable, and periodic. Fixed expenses are those that occur each month in a regular amount, such as rent, car payments, and mortgage payments. Variable expenses are those that change from one time period to the next, such as food, clothing, gasoline, and entertainment. Periodic expenses are those that occur several times a year, such as car insurance and life insurance payments. Gross pay - The amount people earn per pay period before any deductions or taxes are paid. Income - The payment people receive for providing resources in the marketplace. When people work, they provide human resources (labor) and in exchange they receive income in the form of wages or salaries. People also earn income in the forms of rent, profit, and interest. Loan - A sum of money provided temporarily on the condition that the amount borrowed be repaid, usually with interest. Nest egg - An amount of money saved for a special occasion, such as retirement or buying a house. Net pay - Gross pay minus deductions and taxes. Payroll deduction - Amounts subtracted from gross pay. Personal saving rate - The ratio of personal saving to disposable personal income; the fraction of income, after taxes, that is saved. Rule of 72 - A method to estimate the number of years it will take for a financial investment (or debt) to double its value (or cost). Divide 72 by the interest rate (percentage) to determine the approximate number of years it will take the investment (debt) to double its value (cost). Salary - Income earned for providing human resources (labor) in the market. Salaries are generally an annual amount paid monthly or bimonthly for a specified number of hours, usually 40 hours per week. Save - Keeping your money to spend in the future. Saving - Not spending on current consumption or taxes. Saving involves giving up some current consumption for future consumption. Savings account - An account with a bank or credit union in which people can deposit their money for future use and earn interest. Savings goal - A good or service that you want to buy in the future. Savings plan - A schedule listing tasks that, when completed, will allow a saver to reach a savings goal. Spending - Using some or all of your income to buy things you want now. Wages - Income earned for providing human resources (labor) in the market. Wages are usually computed by multiplying an hourly pay rate by the number of hours worked.